How are you going to fill this weekend? If you answered “probably with loads of TV, but I’m not sure what to watch”, you’ve come to the right place. Here are 5 awesome series you should start marathoning! Better Call Saul is a prequel to megahit Breaking Bad, charting fresh-faced (kind of…) lawyer Jimmy McGill’s transformation into sleazy criminal mastermind Saul Goodman. Like Breaking Bad, Better Call Saul is a Shakespearean tale of one man’s descent into greed and evil for reasons beyond his control. And like Breaking Bad, it’s absolutely brilliant. We wouldn’t recommend it you haven’t watched Breaking Bad yet – it works on its own, but is much more entertaining if you’re familiar with the exploits of Walter White and co – but for everyone else, you won’t find many better ways to spend this weekend than in the company of Albuquerque’s finest criminal lawyer. 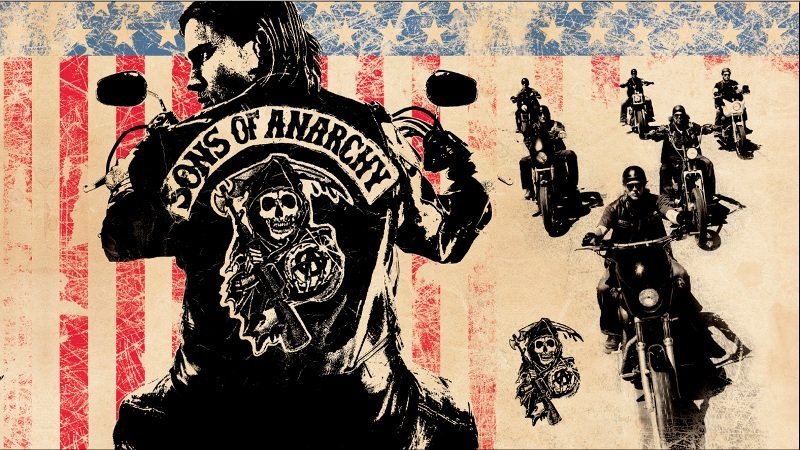 Sons of Anarchy has been on air since 2008 but its only recently that its gained mainstream popularity. The show follows the trials and troubles of Jax, the vice-president of a gun-running motorcycle club called the Sons of Anarchy. SOA is part crime drama, part soap opera and all brilliant. It gets better and better as it goes on too, which means you’ll struggle to stop watching. Draw the curtains, bid farewell to the outside world for a couple of days and try and blitz through as much of it as you can! Not content with dominating the box office, superheroes are gradually taking over TV too. Surprisingly, though, the big hitters are pretty hit and miss. Marvel’s Agents of S.H.I.E.L.D.S has its moments, but is too inconsistent to be essential. Gotham, meanwhile, can’t decide if it wants to be like Christopher Nolan’s Dark Knight Trilogy or the camp 60s Batman and ends up being a weird mix of both. Nope, the best superhero on TV is one most people haven’t heard of: the Green Arrow. Arrow follows Oliver Queen as he takes on the mantle of the Green Arrow after years stranded on an island. Like all good superhero entertainment, it strikes a perfect balance between action and drama, with as much time spent examining the effect Queen’s superhero status has on him and those around him as Queen firing arrows into baddies. With 3 seasons to date, watching the whole show might be a bit of a push. You could have a good go though! Need some extra cash and space for new stuff? Sell your DVDs with musicMagpie! The other great TV trend at the moment is adapting films into shows, with Hannibal the pick of the bunch (although its based on the books too). The show focuses on the relationship between FBI investigator Will Graham and Dr Hannibal Lecter, a forensic psychologist who happens to enjoy eating people. Together, they investigate all kinds of nasty crimes – including some of Lecter’s own. Hannibal’s main strength is its cast, with Mads Mikkelsen making a strong challenge to Sir Anthony Hopkins’ ‘best on-screen Hannibal Lecter’ title. It’s surprisingly deep for a crime drama too, with a strong focus on psychology and the human condition. Heavy stuff for a weekend, but well worth it. The Blacklist has taken the US by storm, drawing in massive ratings and lots of positive critical acclaim. It follows a master criminal called Raymond Reddington (James Spader), who unexpectedly turns himself in to the FBI. However, he has an ace up his sleeve: a list of the most dangerous men in the world, some of which are unknown to authorities, and how to catch them. However, the only person he’ll work with is rookie profiler Elizabeth Keen. If you like 24, Prison Break or any other US thriller of the past 10 years, you’re almost bound to love this. What shows will you be watching this weekend? Tell us in the comments. Overwhelmed by how much good TV there is? Check out this guide! What will happen in Stranger Things Season 2?